One of the world's premier birding destinations, the Texas coast is home to an amazing number of migrating and wintering birds, as well as many 'specialty' resident and nesting species. The habitat diversity ranges from the Pine woods to the Gulf prairies, from the coastal wetlands to the South Texas subtropics. The spring migration of neo-tropical birds along the boast is one of North America's most remarkable birding spectacles. And the region is host to some the nation's largest congregations of herons, egrets, rails, shorebirds, gulls, and terns at any season. The long-awaited revision by Mel Cooksey and Ron Weeks, will be an indispensable as your field guide. 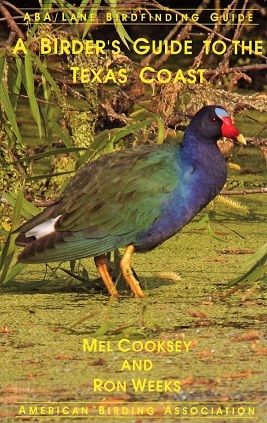 There are Species Accounts for over 170 Texas specialties, and more than 70 new sites, for a total of over 200 birding stops, as well as bar-graphs for 388 regularly occurring Texas Coast species. 334 pages.